Promoter Eddie Hearn, speaking at the post-fight presser for Anthony Joshua-Alexander Povetkin, labelled Tyson Fury “the most unentertaining fighter I’ve ever seen.” Hearn, when asked by members of the media why he wants to see AJ fight Deontay Wilder next and not the self-styled “Gypsy King” said it is down to the excitement levels such a fight would bring. While it is true a Wilder-Joshua collision is a dead-sure pulse-quickener, it’s not always about excitement and nothing more. Fans want to see who is the best heavyweight in the world today: Joshua, Wilder or Fury. Fury may not be the wild and ultra-aggressive puncher Wilder is, but he just might be in possession of the best boxing brain amongst the big men. And what if Fury beats Wilder on December 1; will AJ then fight “the most unentertaining fighter” Hearn has ever seen? In terms of value for money, in as much as seeing vicious exchanges, knockdowns and then a brutal finishing KO, then yes, Wilder-Joshua is your fight. 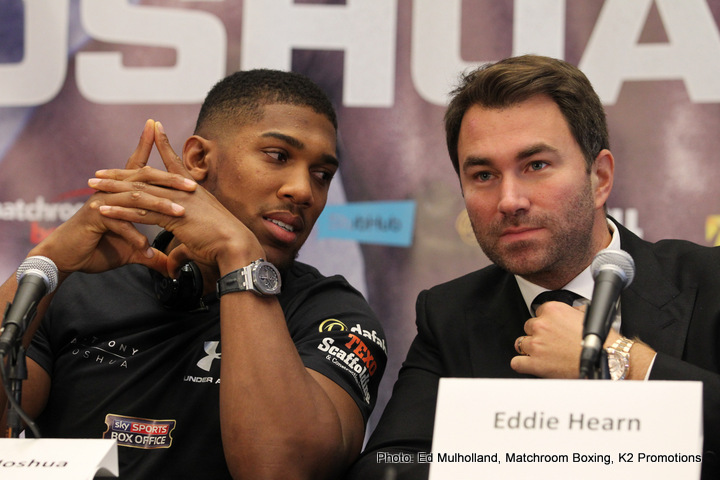 But in terms of seeing who is the best of the best; this could come down to Fury against Joshua. And as for calling Fury the most boring, or most “unentertaining” fighter ever, that is surely going too far. Either that or Hearn has a short memory. What about Johnny Nelson, for example? Who can forget his truly awful fights with Carlos De Leon and James Warring? Or more recently, and not limiting things to British fighters, what about the high level of criticism boxers like Guillermo Rigondeaux, Erislandy Lara, Andre Ward and even Wladimir Klitschko received for being viewed as boring or unentertaining? Fury gave us some terrific action scraps in the earlier days of his career – see the Cunningham fight, the Nicolai Firtha fight, the Neven Pajkic fight and the two John McDermott fights – but he then got smart and began to box masterfully. He may be less thrilling to watch today, but is Fury good enough to beat Joshua and Wilder? That’s the most important thing, surely: finding out who is the best. Who’s fault is it if the subtleties of boxing, the skills involved in hitting and not getting hit get lost on far too many fight fans these days?